Great Wall of Preston: Dock's Vision Muddying the Water? Apparently by mixing contaminated silts from the bottom of the dock basin with cement to construct this dividing wall, and then, according to Council Leader Ken Hudson, "lifting all the silt from one side of the dock and setting it at the back of the wall so you fill the dock with its own sludge", it is hoped that the water quality on the non-sludged side of the wall would be of 'bathing quality' and therefore water sports could take place on that section of the dock basin. 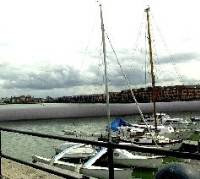 These ideas for the Dock basin wall are clearly ideas only at this stage, forming "one of several options being considered in a feasibility study on Preston Council's Quayside Project", as there would need to be a detailed assessment of the economic and environmental costs of such a procedure, not to mention the huge reduction in the navigable area of the Dock basin (- one of the largest single dock basins in Europe we believe - at the moment anyway! ), and the scheme is intended to include the floating homes idea which has been raised before - presumably on the sludgy half?! - how the silted-up half of the basin will look and smell! 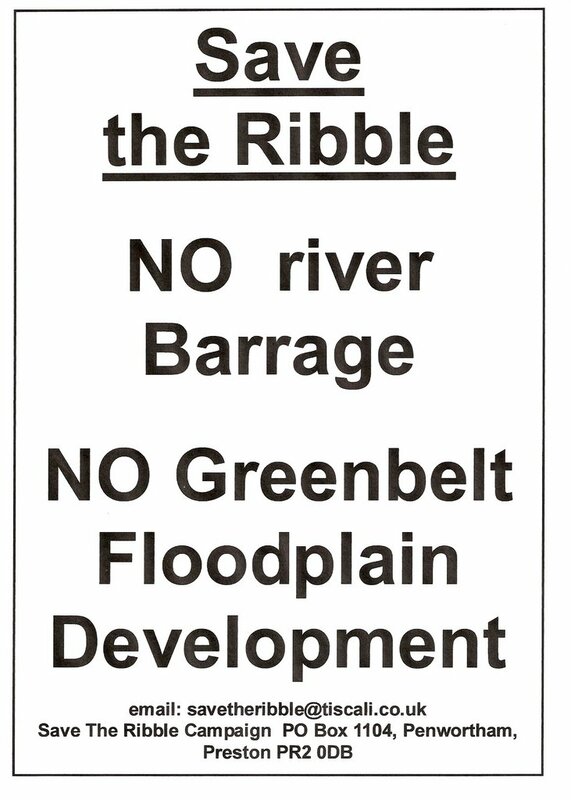 - What these proposals will mean for the associated ideas for developing the Ribble corridor - presumably the Preston side anyway as South Ribble Borough Council have pledged to protect the Ribble banks and Green Belt areas from development. 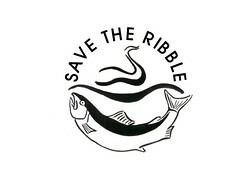 Whilst things are quiet on the Save The Ribble front, as the Penwortham Green Belt and floodplain has been saved from the Riverworks proposals for a huge housing estate, designated instead a new Country Park by South Ribble Borough Council - exactly what local people were asking for! 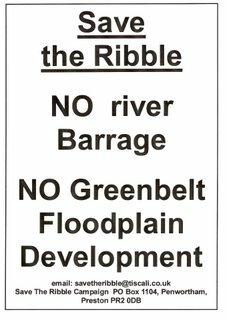 - and the Ribble barrage proposal "off the agenda" at Preston Borough Council - for the time being at least, Ribblesiders are free to enjoy the unspoilt pleasures of life by the Ribble - pleasures that money can't buy. Even in the depths of winter, the Ribble is a beautiful habitat for people, and an essential habitat for wildlife. As the RSPB emphasise, the Ribble and other West coast estuaries are VITAL for wildlife on an international scale, particularly in freezing temperatures such as we have at the moment. A walk alongside the mudflats in Broadgate and Penwortham at low tide will reward you with the sights and sounds of just some of the birdlife the Ribble supports through the winter, from Teal to Goosander to gulls to my personal favourites the Redshank feeding by the water's edge, their melancholic tew-tew-tew echoing along the water. 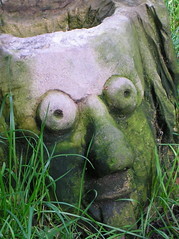 'My parents still live near Savick Brook. I spent hours,days and years down there as a child and teenager and I still walk and run there whenever I can. I went to Savick school and have vivid memories of gazing out of the upper windows at the swollen brook in winter rain, of trying to decipher the contours of its older courses in other weathers and seasons. The canalisation of the brook has been a complete waste of money and a small environmental disaster destroying tidal flows and wildlife habitats along its length. It's no longer a place where children from the Lea and Savick estates could play (PE), observe wildlife (Biology), see nature at work in the form of water erosion (Geography), or wonder at the different textures of sand and mud (Geology). Nothing to do now but hang out at the lock gates, grafitti the thoughtfully supplied information boards (suppose that's Art) or trudge along tarmac paths - subjects for someone else's study of Sociology instead of active learners. And I've seen just one boat in how ever many years since it was opened (Economics). - thanks Diane: of course, by not barraging rivers or building on the floodplains will certainly help prevent flooding worsening! Penwortham wetlands overlooked by the Preston Junction Nature Reserve, still beautiful in Winter, and birds of prey can often be seen hunting here - thanks Chris! Also, you can read about how Preston Junction Nature Reserve is currently being considered for a REMADE in Lancashire facelift, hoping to improve access to and from Bamber Bridge and Preston - directly into Fishergate Centre car park and the train station - by bike and walking, whilst preserving and enhancing the wildlife facilities of the Nature Reserve and its adjoining habitats!